My daughter Olive loved reading Cosmo and the Robot by Brian Pinkney. This science fiction picture book recounts the adventures of two kids living on Mars. They explored the red planet, saved a broken robot and used a variety of space tools in their adventures. In Born Reading: Bringing Up Bookworms in a Digital Age, I described how Olive and I turned that book into an elaborate game–reenacting the entire book with my daughter’s toys. Extending our interactive reading of the book, we literally acted out the book in her room. Below, I’ve linked to all the different books, apps, games and other digital materials we used to build this Born Reading Bundle. If you are looking for more science fiction picture books for kids, check out this excellent Goodreads list. 1. Start with books. 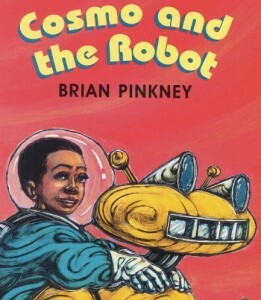 Read Cosmo and the Robot by Brian Pinkney. Then check out The Berenstain Bears on the Moon and Tool Book by Gail Gibbons to expand conversations about space travel and tools. 2. Try the Magic School Bus. We watched The Magic School Bus Lost in Space episode, letting Olive see some of the other planets in the Solar System with the popular kid’s cartoon. Looking online, I found a whole collection of free activities at Scholastic related to this episode. 3. Then go back to books. Try the Dr. Seuss-inspired There’s No Place Like Space! : All About Our Solar System book. Oceanhouse Media also created a digital version of this book, complete with a telescope and interactive constellations in the nighttime sky. Born Reading Bundle: Cosmo and the Robot 1. Make toilet-paper tube binoculars, a bedroom spaceship or other pretend toys from the book. 4. Explore free National Geographic videos. The National Geographic Space & Science section online for more free videos of space, space technology and other inspiring stuff. 5. Find more science fiction books at your library! The excellent Science Fiction Picture Books list at Goodreads collected more than one hundred picture books, enough reading to keep a kid busy for months. 6. If your older kid loves science fiction, try the X Minus One archive. This is a free collection of old time radio shows adapting classic science fiction tales. This entry was posted in Born Reading Bundles.